Haulmark Trailers supplies a variety of side tippers that are well suited for use in carting bulk products in road train and B-double applications. Providing an efficient and stable means to ensure precise tipping in on and off road conditions, these side tippers can be customised to suit the specific haulage requirements of the operator. Tub capacities range from 10 cubic metres up to 70 cubic metres, with tub and door hinging designs utilised that assist in delivering low maintenance, trouble free operation. 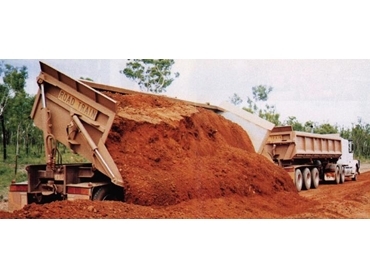 The hydraulic systems incorporated in these side tippers are synchronised. The use of overcentre valves and lock valves ensures the consistent and safe tipping process is maintained through the unit's life cycle.